Environment and environmental systems have memories which become heritages common to several civilizations. The river and valley systems at Diyarbakır are such a heritage, whose future depends first today on our decisions and deeds, but also on the history of the system dynamics. This history is recorded in the terraces stretching along the river flood plain, and in the relationships between the river and the substratum that it incises. In 2014, we investigated the Hevsel gardens, which correspond to river terraces stepping at the foot of the city walls (right bank), but also at the foot of the plateau over which the University is built (left bank). The results presented here fix the general context of our further studies (2015): 1) a topographic profile of the terraces from the foot of the City walls to today’s active bed; 2) the map of the terraces on the right bank of the river at Diyarbakır (corresponding to Hevsel gardens); 3) a preliminary geological section from the City to the river; 4) the stratigraphy of a sediment core retrieved from an abandoned channel of the river in one of its youngest terraces. 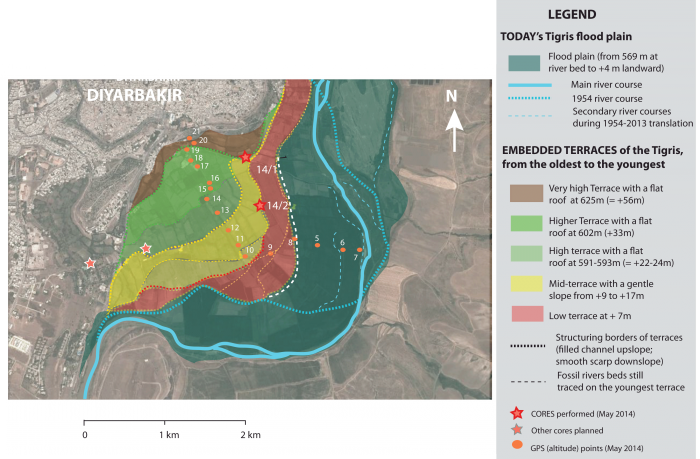 Finally we expose our plans for future studies, which will investigate not only (1) deep cores to be set in terraces of different ages at the Diyarbakır location, but also other parts of the watershed such as (2) the remnants of a river network allowing the Tigris to join the Euphrates West of the Karacadağ volcanic massif, and (3) possible sediment archives contained in the collapsed bottom of dolines in the Bismil vicinity. This paper has previously appeared in Diyarbakır Kalesi ve Hevsel Bahçeleri Kültürel Peyzajı Kitabı, Ege Yayınları, Istanbul, 2015, an undistributed and limited publication edited by the Townhall of Diyarbakır in the frame of the Unesco Heritage List application of the Diyarbakır City. The study is realized in the frame of a scientific collaboration programme between Dicle University Ziya Gökalp Education Faculty Geographical Education Department Head Dr. Sabri Karadoğan, and the CNRS and Paris 1 University’s Physical Geography Laboratory (LGP, France) A-Rank Researcher Catherine Kuzucuoğlu. The study contributes to the AMIDA Project, which is co-ordinated by Dr. Martine Assénat from Montpellier University (CRISES, France), the Diyarbakır Metropolitan Municipality, and the French Institute for Anatolian Studies in Istanbul (IFEA, Turkey). 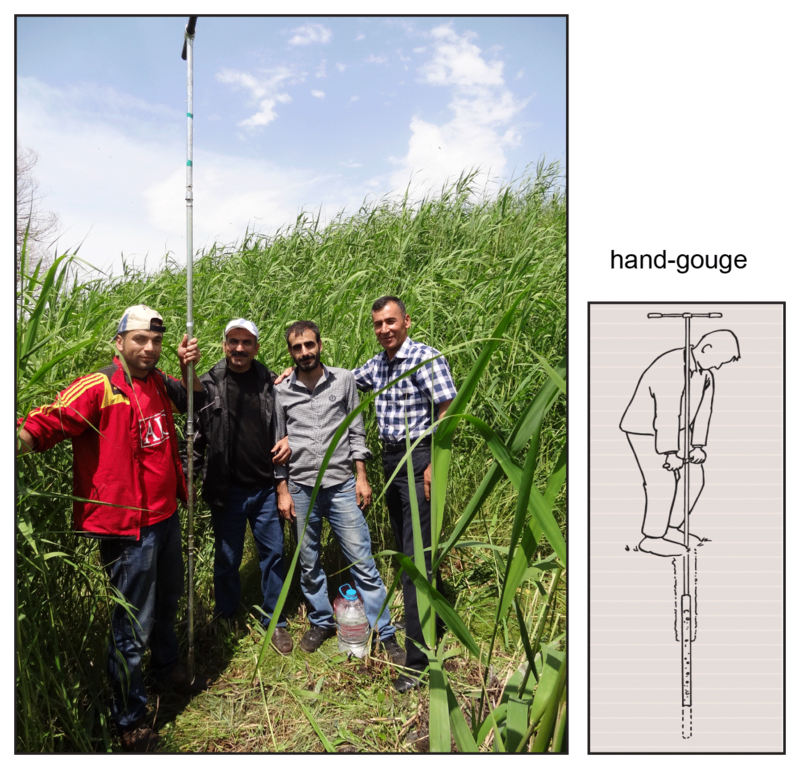 Logistic supports to research in the field has been provided by the Diyarbakır Metropolitan Municipality (thanks to M. Alökmen, N. Soyukaya and Z. Sila-Akıncı), and by the Bismil Municipality (car and driver). 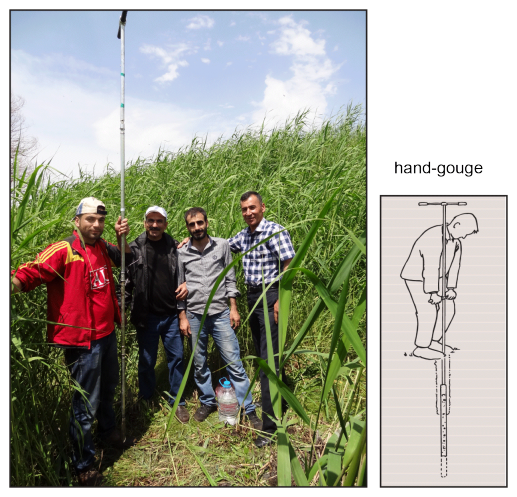 Coring in the field highly benefited from the contributions by Rıdvan Arı, Yusuf Baran, Berzan Dindaroğlu, Şahin Kalçık, Tahir Ramazan Turgut, Ridvan Ter and Aziz Yoldaş, all geography students of Dicle University. May all be sincerely thanked. In France, financial support was provided by the Laboratory of Physical Geography in Meudon (Paris 1 Univ., U-Pec Univ., CNRS), and the Ministry of Foreign Affairs (AMIDA Project - ENVI-MED Programme). In 2015, the project will receive additional support from the ARCHEOMED Project (CNRS-INEE / PALAEOMEX- MISTRALS, France) and from the ANAGRAM Project also selected by the ENVI-MED Programme. 1The Tigris valley is a special area that requires examination from both archaeological and geomorphologic perspectives (Algaze et al. 1991; Parker and Creekmore 2002; Karadoğan and Kozbe 2013; Kuzucuoğlu 2014). In spite of this high interest, the knowledge of the geographical context of the region in the past is still restricted. 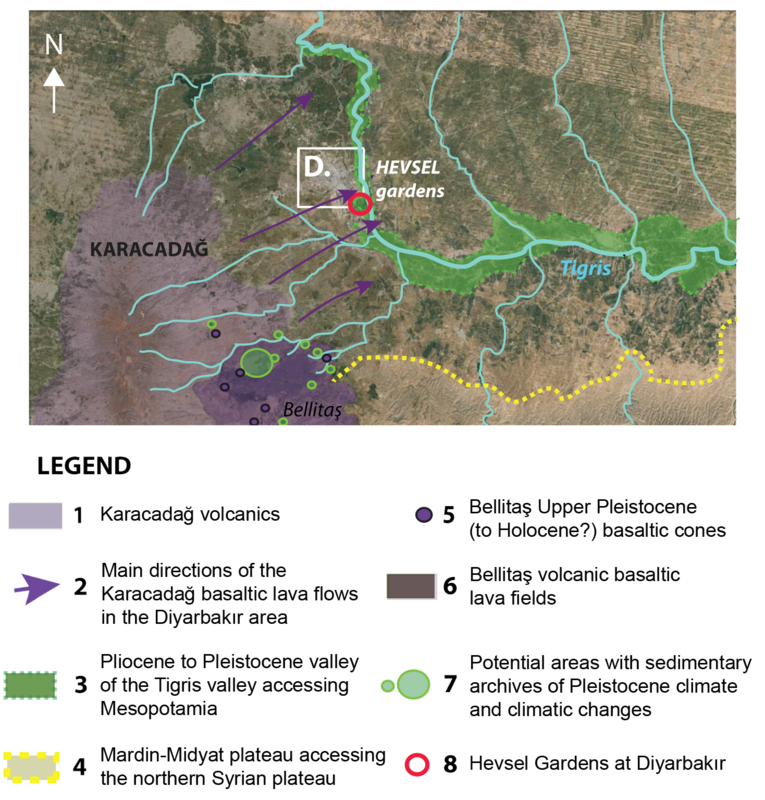 As lakes and valley floors contain the best archives that would reduce this international information gap, we have set up a research project on the Upper Tigris watershed. Draining a large part of Upper Mesopotamia up to the eastern Anatolian highlands, this watershed must contain indeed the morphological and sedimentary data capable of defining (i) today’s dynamics of the hydrosystem and fluvial ecosystem on a regional (e.g. the river watershed) and local (e.g. Diyarbakır City and Hevsel gardens) scales, whether controlled by man or by natural context (geology, climate, vegetation), (ii) the evolution of the climatic and environmental contexts in the region during the last glacial (Upper Pleistocene) and today’s interglacial period (the Holocene), and consequently (iii) the geographical context of human societies’ evolution in the River Tigris valley from the earliest Prehistory to the modern times (Fig. 1). 2In this frame, the study of fluvial archives aims at understanding river dynamics today and in the more or less recent past, focusing namely on the river regime (timing, magnitude, regularity of floods, and relations to climate), the sedimentation modes and sediment types, the changes in bed types and location, the bank-bed-valley floor erosion, the terrace records, the substratum constraints etc. 3A series of general questions conducts our approach and methods. What kind of events, what kind of records, framed in which chronology can we expect from the study of (i) the stepped terraces which are clearly recognizable in the landscape on both sides of the river valley and (ii) the various sediment fills and river morphology changes also recognizable in the valley bottom? 4The study of these terraces and valley fills is expected to allow evidencing different phases of sedimentation and erosion, and identifying the causes and processes of changes in dynamics, (Kuzucuoğlu et al. 2004). In this prospect, we expect from a focus on the connections between the terraced Hevsel gardens and today’s environmental dynamics, to provide results contributing to the reconstruction and understanding of the river imprints over the geographical formations in the valley through time. What kind of relationships was established in the past between human societies, the river dynamics (floods, low waters, erosion, lateral translation, incision, navigability etc. ), its valley and terraces (topography and resources such as soil and vegetation, humanized landscape such as roads, walls, dams, canals, mills…)? 5Answering this question requires the detailed reconstruction of both the palaeoclimatic and the palaeohydrological contexts of the region. This objective can be reached with the study of various indicators contained in the geomorphologic and sedimentary archives, whether their nature is stratigraphic, biologic, chemical, mineralogic etc. Such archives exist in the valley bottom and slopes, and in closed depressions especially those that have been occupied by a lake (Kuzucuoğlu et al. 2011). 6After an exploratory field survey was realized in February 2014, the mission that took place in May 2014 focused on the zone of interest for the AMIDA project: the Hevsel gardens at the foot of the Diyarbakır City walls. 7A second area also attracted our attention and efforts because of its richness in lakes: the river valley between Bismil and Batman. The results obtained in that latter area being out of scope of this paper on the Hevsel gardens and Diyarbakır area, they are not presented here. GPS data are measured at more or less regular intervals along a transect-line established through the valley from the right bank of the river active bed, to the foot of the city walls (Diyarbakır city door). Intervals between positioning points narrowed when topography evidenced a morphological step. Coring aimed at collecting sediments accumulated in the terraces. The approach was exploratory, before a more complete study of several meters-thick alluvial sequences with a motor-mounted-coring truck device. Exploratory equipment used was hand-manipulated 2 cm-wide-open gauges expected to be able to penetrate easily sandy and gravely sediments (Fig. 4). Despite the thin diameter of the gauges, this hand coring in terraces was extremely difficult. Interpreting the LANDSAT TM 2014 composite satellite imagery made available by Google Earth on Internet. Interpretation is based on distinguishing visually surface data captured by the satellite sensors. “Colours” (more or less black and white) and their intensities (from 0 to 256) are considered to record the vegetation cover (type and density) and the soil surface conditions (sediment types and water content). This differentiation between surface colours and colour intensities provides the distinct elements used in the mapping of the terrace scarps and past riverbeds. Drawing a map of terraces (scarps, flats) and former river beds (filled channels). The mapping uses the information delivered by the satellite interpretation described above. 10Walking through the right-bank side of the flood valley through the Hevsel gardens, we measured altitudes with a GPS, noting topographical scarps between flatter surfaces. 11The profile obtained exposes an incision/sedimentation succession forming embedded terraces recording major changes in the river dynamics and sediment load. Resulting from a progressive side-translation of the River Tigris south-eastwards (away from the basalt cliff) which contributed up to recent times to their preservation and to the preservation of the Hevsel Gardens, these stepped terraces also record a history of the valley and of the river, which is rhythmed by periods of sedimentation followed by periods of incision, in a general context of deepening of the valley (Bridgland and Westaway 2008). 12Combining topography and altitude measurements, we obtained the profile shown in Fig. 5. In this profile, the 7 to 21 numbers correspond to the measurement sites, while the 1 to 5 numbers in circles rank upwards the flat surfaces separated by scarps. These five surfaces correspond to five terraces (“T1” to “T5”) above today’s flood plain (“T0”) “T0” is not shown on Fig. 5. 13Confronting the satellite interpretation with data from the GPS-based topographic profile, allowed us to transfer the SRTM-based data on the spot-scale (GPS data) and along the topographic profile to the valley-scale in Fig. 5. A map (Fig. 6) is produced, based on both the field data collection (GPS data and field observation) and the interpretation of satellite imagery. In the legend, each of the 1 to 5 surfaces is defined by its mean altitude relative to that of today’s riverbed of the Tigris (“T1”). Besides, “T3” seems to be composed of two sub-levels between + 9 and + 17m (Figs. 5 and 6). 14This cross-section is based on GPS-based profile of the terraces, with the addition of exposures of old alluvium (Fig. 3), basement rocks (Fig. 8), volcanic flows (Fig. 9). These exposures outcrop in sections open by roads or any other kind of natural or artificial vertical erosion below the walls, in terraces, in the gardens. A terrace immediately below the City Walls (GPS point 21 on profile Fig. 5) is not an accumulation terrace as it truncates the substratum (= a reddish clay photographed in Fig. 8). Either it is an erosion terrace, or it is man-made. The oldest terrace at + 56 m (GPS point 20 on the profile Fig. 5, coloured in brown in Fig. 6), is a stepped terrace. In the geomorphologist’s “lexicon”, a “stepped terrace” is a kind of contrary (with regards to the genetics of the form) to “embedded terrace”. The “stepping” is formed (like here) by the bedrock outcropping below the alluvial deposit constituting the terrace, and within its limiting scarp which is incised in the bedrock (a usual sign of river response to tectonic uplift). In addition, in the gardens at the scarp-limiting terrace T5, a basalt outcrop forces water running over the surface of T5 to flow as a waterfall over the scarp (Fig. 9). 16This outcrop suggests the occurrence, at Diyarbakır, of two distinct basalt flows (Westaway et al. 2009), an information that would be very important for the study of the city walls. If correct, this observation means that a fault controls the right bank of the valley. 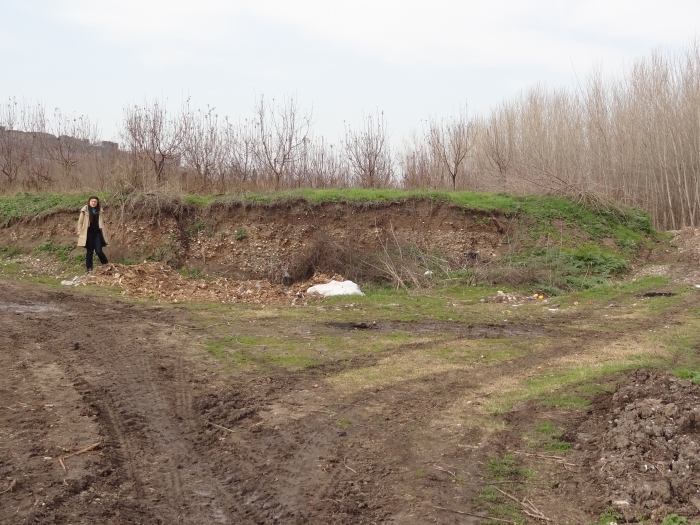 17Terraces survey however suggests that this outcrop in the garden may result from the breaking of the Diyarbakır basalt flow in two parts: one remained at its initial altitude forming the plateau; the other own fell down ca 100 m (in the gardens). 18The estimated magnitude of the fault movement or fall would be ca 100 m high, possibly more. According to terraces elevations, the possible fault seems to have caused -or partly caused- the 20 m scarp separating T6 from T5 (Fig. 7). 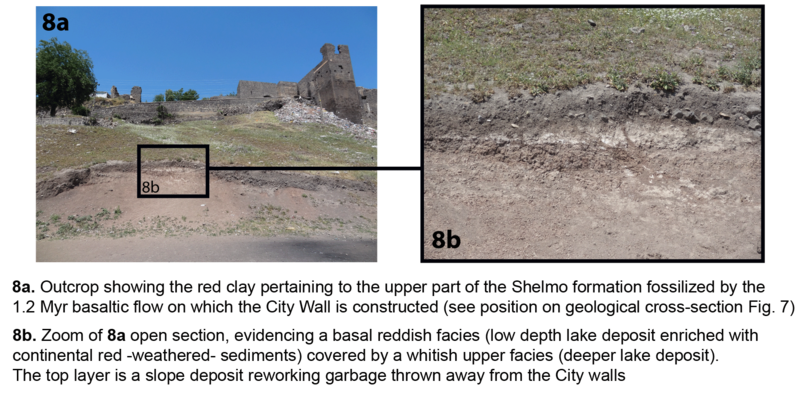 The occurrence of a fault breaking the Diyarbakır City lava flow would explain the SE migration of the riverbed, and the terrace stepping, which follows the accentuation of the curve incised by the riverbed south-eastwards from Diyarbakır location. 19This also means that (i) there will be some difficulty to distinguish climatic causes from tectonic causes with regard to the evolution and change of river dynamics; (ii) a well-constrained chronology is needed, which is now expected from coring programmes. 20Sediments in the valley should provide indications about the time and space distribution of the elements composing the hydrosystem in both the recent and remote past. Together with the field study as exposed above, a complementary exploration of sediments was realized by coring the sediments in the valley. In May 2014, two spots were cored in the Hevsel Gardens. 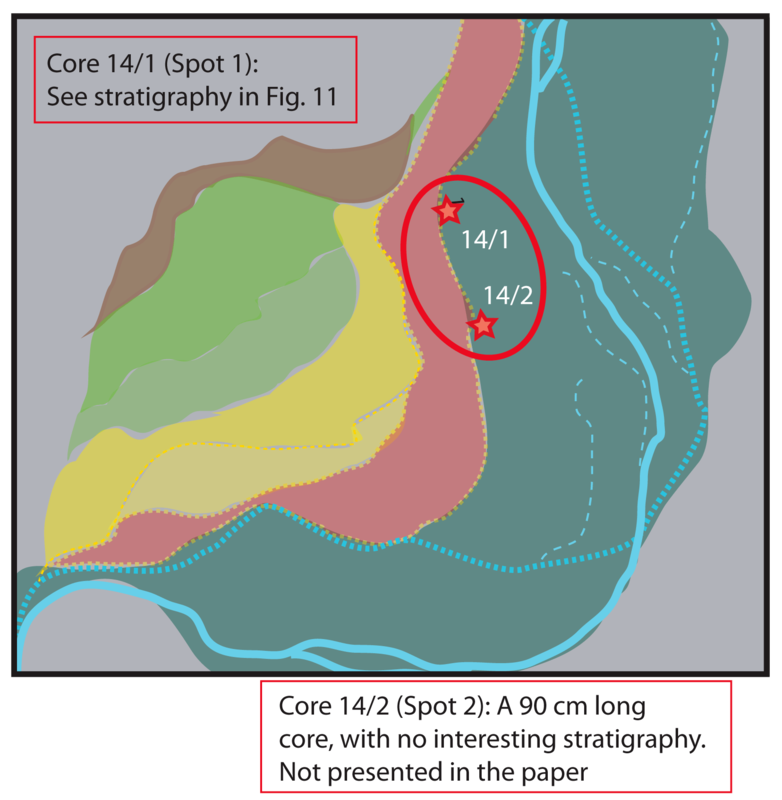 21According to satellite imagery and to field observation, the two spots were chosen in a channel fill (a former bed of the river: Fig; 10) which has been abandoned at the foot of the scarp limiting “T2” above “T1” (Fig. 5). 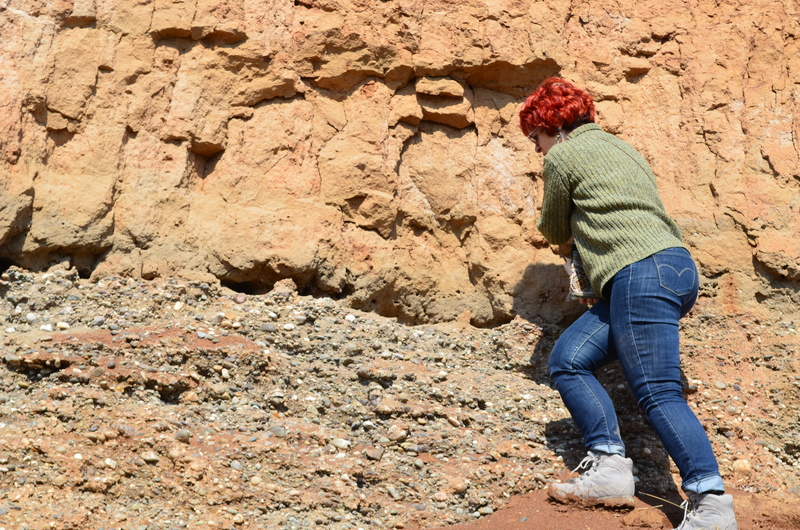 The results concern the stratigraphy and the facies analyses of the sediments cored. Only the sequence from the Core Spot 1 could be interpreted in a time sequence. At Core Spot 2, we have been able to retrieve only 90 cm representing a superficial part of the fill, non-usable for our purposes. 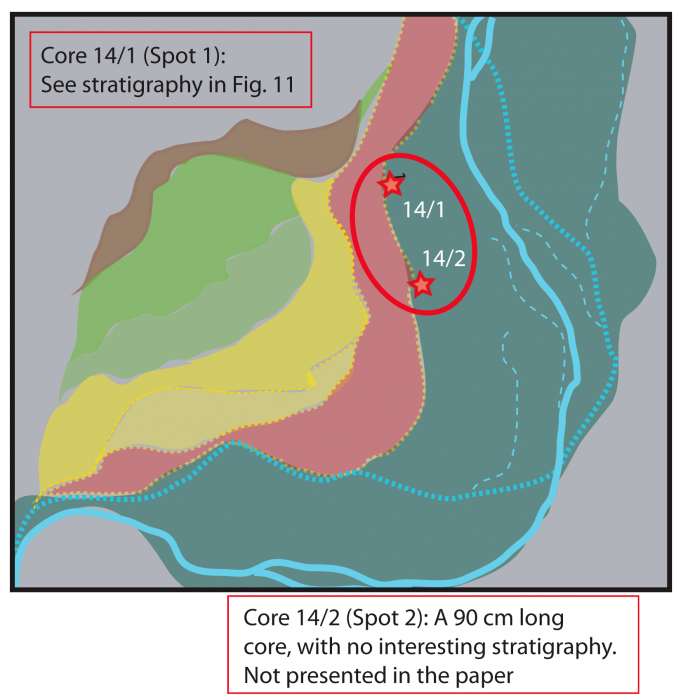 The facies analyses and the stratigraphy of Core Spot 1 (Fig. 11) are typical of the abandonment of a lateral channel (a former active bed): the grain size of the river sediment thinners upwards. From gravelly at the base, the sediments become sand-enriched; at the end of the process only clay is deposited, in a calm and waterlogged environment favourable to the tree and herb vegetation. The corer could not reach, however, the older sediment formation in which the abandoned channel was formerly incised at the end of the accumulation period of “T1”. 22Because of the lack of samples suitable for 14C dating, both from the sections identified and from the sequences cored, no sample could be sent for dating. Logically, there was no sense in realizing laboratory analyses if the samples could not be set into a chronological frame. Nevertheless, we estimate both “T1” terrace, and the cored abandoned river bed, to date Late Holocene, most probably Middle Ages at the earliest, or end of the Little Ice Age after AD 1860. 23In order to achieve our scientific goals, both regarding the Hevsel Gardens and the Tigris River Valley, we plan a series of operations for 2015 and the following years. in the valley: (i) the terrace ages and modes of formation; (ii) the evolution of the river regime and bed styles, as well as the deposition vs erosion dynamics; (iii) the rapidity of riverbed translation changes over the flood plain; (iv) the role of tectonism and of gypsum dissolution in the overall evolution of the valley at Diyarbakır. Impacts of both factors may have, even today, tremendous impacts on the management (water use, barrages etc.) and future dynamics. the rapid climate changes (the RCCs: e.g. Weninger et al. 2009) which are known to be somewhat acquainted with cultural changes, whether on the long-scale (such as Late Neolithic development, choices in production types) or on the short-scales (civilisation collapses at the ends of the 3rd and 2nd mill. BC and the 1st mill. AD: Kuzucuoğlu & Marro 2007). 26Collecting indications about older phases of the river regime and morphology needs coring with a motorized device capable of crossing and sampling thick layers of coarse sediments such as sand (banks, bars, migrating islands, overbank flood deposits) and gravels (river bedload, islands). 27This future coring work in the gardens will be defined according to the profile of the Hevsel terraces obtained in 2014. Accordingly, we shall work on detailing the geomorphologic and geologic (stratigraphy, sedimentology, structure) cross-section of the river valley, from the top of the relief in which the valley is incised to the flood plain. 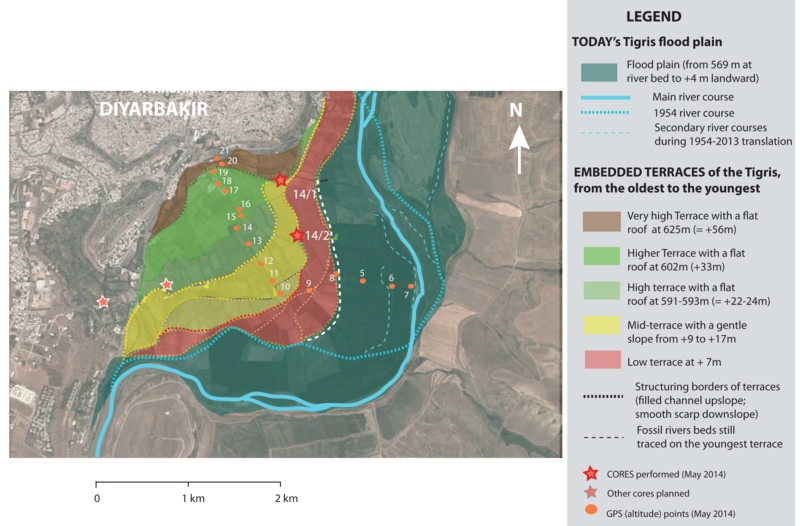 28The coring will also concern both banks of the valley: the right bank (explored in 2014) from the river through the gardens up to the city; and the left bank of the river, facing Diyarbakır where GPS data collection, mapping terraces etc. will also be performed. 29Samples from the cores will be analysed in the laboratory. According to aim of analysis and availability of material, the following analyse may be needed: the sedimentology (grain-size, magnetic properties, mineralogy, organic content, soil structure), the geochemistry (inorganic and organic carbon, nitrogen), the biologic proxies (pollen diatoms, molluscs, phytoliths). In addition, C14 chronology (on organic matter) and K-Ar dates (on lavas) will be performed, depending on funding. 30Also depending on funding, Master and hopefully Doctorate students must be involved in the research programme, both for various analyses and/or also for data based satellite/GPS data (GIS treatments). These students’ researches will concern the geomorphology, as well as the effects of regional and global climate changes. They will especially focus on the succession of events (hydrologic, climatic, geologic) that have impacted the landscapes and the societies (land use, social history, settlements). Among these events, processes related to tectonism (uplifts, earthquakes, fault activity impacts on surface morphology) and karst (existence of any underground gypsum dissolution impacts?) must be explored with attention. 31Environment and environmental systems have memories. Our researches ambition studying the objects capable of retaining and delivering to us parts of this memory. What happens today to the river and valley systems at Diyarbakır depends of course of today’s Man’s decisions and deeds. But it fundamentally depends on the history of the system. Forgetting the past in the analysis of dynamic systems, is more than an error. Our responsibility towards our future, and the future of environmental systems that sustain us, makes it a fault. If we want to understand what happened in the Tigris Valley and the Diyarbakır Gardens since at least the Assyrian Empire, i.e. the time when the gardens are first evoked in cuneiform texts 3000 years ago, we must thus absolutely think inside the temps long (the “long duration” approach: see Braudel 1987). The memory of the system indeed, i.e. 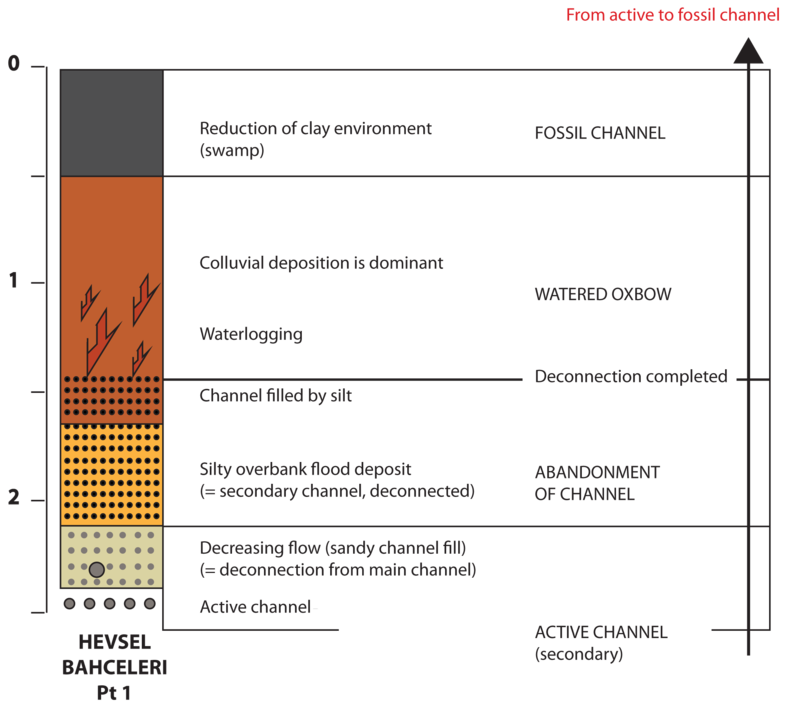 the century to pluri-millennium-scaled changes imposed by the substratum context, the volcanic activity (e.g. see Annex 1), the climate conditions, the deposition and erosion dynamics, the tectonic uplift and associated earthquakes, the impacts of past human activities and management etc… (e.g. see references in Annex 2), strongly constrains the dynamics and the future of the environment. 32The Hevsel Gardens are such objects capable of containing information about the “temps long” of the City of Diyarbakır. Besides, the terraces sustaining the Hevsel Gardens also record hydrological and climatic changes in the valley, from the Last Glacial1 to the Holocene, until today. 33To date, no age, no stratigraphy, no sedimentology are available for the Hevsel gardens and the Tigris terraces at Diyarbakır. Figures 5 to 7 show clearly that defining and dating the landscapes previous to the gardens, or during the activity period of the gardens need coring all terraces. 34Our 2014 coring experience shows that future coring in recent and old alluvium must be performed with a motorized corer, which will be able to break through gravel layers. Only this way will we be able to reach layers and deposits from different periods in the formation of today’s river flood plain and terraces. 35In the Upper Tigris watershed, we plan to study the geomorphologic and climatic records, which will provide for the wider space (regional) and time (Braudelian temps long) of the history of environment in the region and in the river’s life span. 36In the frame of this history of the river basin, our expected results should enlighten periods of stability and instability in the fluvial dynamics. Such a reconstruction must be set in relation to the occupation of the region by human societies. Indeed, due to its primary role in the appearance of agriculture, the whole Tigris basin is critical for the humanity’s history (Fig. 1) (e.g. Karadoğan and Kozbe 2013), from the Pre-Pottery Neolithic period (PPN: e.g. Özdoğan 2007; Kuzucuoğlu 2014) to the Middle Ages (Ottoman Empire), from the end of the Younger Dryas (11400 years ago to the 8.2 cal BP rapid event (e.g. Weninger et al. 2009), from the Akkadian Empire at the 4.2 ka cal BP climatic crisis to the end of Hittite Empire during the 3.2 ka cal BP climatic crisis, from the Assyrian wars to the arrival and retreat of the Roman Empire, from the Byzantine to the arrival of the Seljuks... Our time-scope thus covers in the basin: (i) the Last Ice Age (especially since its maximum 35-16.000 years ago: e.g. Sarıkaya et al. 2011), (ii) the Late Glacial, which saw the first Fertile Crescent human settlements in the Upper Tigris basin, (iii) the Holocene, when this region became a centre for the development of plant and animal domestication techniques and of urbanisation as well as State formation. Algaze, G.; Breuninger, R.; Lightfood, C.; Rosenberg, M., (1991). “The Tigris-Euphrates Archaeological Reconnaissance Project: A preliminary report of the 1989-1990 Seasons”, Anatolica XVII p. 175-240. Braudel, F., (1987). “Histoire et Sciences Sociales : La longue durée”, Réseaux, 5(27), p. 7-37. URL: http://dx.doi.org/10.3406/reso.1987.1320. Bridgland, D.R. ; Demir, T.; Seyrek, A.; Pringle, M.; Westaway, R.; Beck, A.R. ; Rowbotham, G.; Yurtmen, S., (2007). “Dating Quaternary volcanism and incision by River Tigris at Diyarbakır, Southeast Turkey”, Journal of Quaternary Sciences 22, p. 387–393. URL: http://dx.doi.org/10.1002/jqs.1074. Bridgland, D.; Westaway, R., (2008). “Climatically controlled river terrace staircases: a worldwide Quaternary phenomenon”, Geomorphology 98, p. 285-315. URL: http://dx.doi.org/10.1016/j.geomorph.2006.12.032. Doğan, U., (2005). “Holocene fluvial development of the Upper Tigris Valley (Southeastern Turkey) as documented by archaeological data”, Quaternary International 129, p. 75-86. URL: http://dx.doi.org/10.1016/j.quaint.2004.04.008. Karadoğan, S. and Kozbe, G., (2013). “Yukarı Dicle Havzasının (Batman-Bismil Arası) Jeomorfolojik Özellikleri ve Arkeolojik Yerleşme/Buluntu Yerlerinin Dönemler Boyunca Mekan Etkileşimleri”, In Öner, E. (ed. ), Professör Doktor İlhan Kayan’a Armağan, İzmir, Ege Üniversitesi, p. 540-564. URL: http://www.dicle.edu.tr/a/skaradogan/eser/f2.pdf. Kuzucuoğlu C.; Dörfler W.; Kunesch S.; Goupille F., (2011). “Mid- to late-Holocene climate change in central Turkey: the Tecer lake record”, The Holocene, 21(1), p. 173-188. URL: http://dx.doi.org/10.1177/0959683610384163. Kuzucuoğlu, C.; Fontugne, M. and Mouralis, D., (2004). “Holocene terraces in the Middle Euphrates valley, between Halfeti and Karkemish (Gaziantep, Turkey)”, Quaternaire 15(1-2), p. 195-206. URL: http://dx.doi.org/10.3406/quate.2004.1767. Kuzucuoğlu, C. and Marro, C. (eds. ), (2007). Sociétés humaines et changement climatique à la fin du troisième millénaire : une crise a-t-elle eu lieu en Haute Mésopotamie?, Actes du Colloque de Lyon (5-8 décembre 2005), Varia Anatolica XIX, IFEA / De Boccard, Istanbul / Paris. URL : http://www.persee.fr/issue/anatv_1013-9559_2007_act_19_1. Kuzucuoğlu C., (2014). “Contextes régionaux du Néolithique en Anatolie: aspects environnementaux et chronologiques”, In Arnaud-Fassetta, G. and Carcaud, N. (eds), La géoarchéologie française au XXIe siècle/French geoarcheology in the 21st century, Paris, CNRS Press, p. 131-146. Laneri, N.; Pfälzner, P. and Valentini S. (eds. ), (2012). Looking North The Socioeconomic Dynamics of Northern Mesopotamian and Anatolian Regions during the Late Third and Early Second Millenium BC. Studien zur Urbanisierung Nordmesopotamiens Band 1, Wiesbaden, Harrassowitz. Özdoğan, A., (2007). “Çayönü”, In Özdoğan, M. and Başgelen, N. (eds. ), Anadolu’da Uygarlığın Doğuşu ve Avrupa’ya Yayılımı: Türkiye’de Neolitik Dönem, Yeni Kazılar, Yeni Bulgular, Istanbul, Arkeoloji ve Sanat Yay., p. 57-97. Parker, B.J. and Creekmore, A., (2002). “The Upper Tigris Archaeological Research Project: A Final Report from the 1999 Field Season”, Anatolian Studies, 52, p. 19-74. URL: http://dx.doi.org/10.2307/3643077. Sarıkaya, M.A. ; Çiner, A. and Zreda, M., (2011). “Quaternary Glaciations of Turkey”, In Ehlers, J.; Gibbard, P.L. ; Hughes, P.D. (eds. ), Developments in Quaternary Science 15, p. 393-403. URL: http://dx.doi.org/10.1016/B978-0-444-53447-7.00030-1. 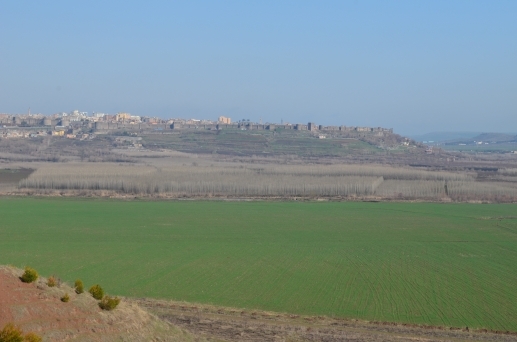 Türkecan A., (2014). Türkiye Volkanitleri. Güneydoğu Anadolu Bölgesi Volkanitleri (Böl. 9). In MTA Pub (Ankara), p. 257-266. Weninger, B.; Clare, L.; Rohling, E.; Bar-Yosef, O.; Böhner, U.; Budja, M.; Bundschuh, M.; Feurdean, A.; Gebe, H.G. ; Jöris, O.; Linstädter, J.; Mayewski, P.; Mühlenbruch, T.; Reingruber, A.; Rollefson, G.; Schyle, D.; Thissen, L.; Todorova, H.; Zielhofer, C., (2009). “The Impact of Rapid Climate Change on prehistoric societies during the Holocene in the Eastern Mediterranean”, Documenta Praehistorica, XXXVI, p. 7-59. URL: http://dx.doi.org/10.4312/dp.36.2. Westaway, R.; Guillou, H.; Seyrek, A.; Demir, T., Bridgland, D.; Scaillet, S.; Beck, A.; (2009). “Late Cenozoic surface uplift, basaltic volcanism, and incision by the River Tigris around Diyarbakır, SE Turkey”, International Journal of Earth Sciences 98, p. 601–625. URL: http://dx.doi.org/10.1007/s00531-007-0266-z. Kuzucuoğlu, C. and Marro, C. (eds. ), (2007). Sociétés humaines et changement climatique à la fin du troisième millénaire: une crise a-t-elle eu lieu en Haute Mésopotamie?, Actes du Colloque de Lyon (5-8 décembre 2005), Varia Anatolica XIX, IFEA / De Boccard, Istanbul / Paris. URL: http://www.persee.fr/issue/anatv_1013-9559_2007_act_19_1. it is easy (although expensive) to date basaltic flows. Such flows (and other eruptive products) are thus very useful for setting chronological frames to climatic and environmental events in the area (see below). West of Diyarbakır, the Karacadağ basaltic shield volcano (1945 m) is the largest volcano of Turkey (and the Middle East?). It is formed by an abundant fissural activity that emitted lavas forming today a N-S oriented accretion cupola-shaped shield west of Diyarbakır (Fig. 13). The longest of the flows eastwards reached the area of Diyarbakır and of the River Tigris present valley where a flow remain forms, for example, a high promontory overlooking the river valley left bank. Two periods of activity are known: (i): 11 to 10 Million years (Ma), i.e. Upper Miocene2; (ii) 6.7-6.6 Ma, i.e. Transition Mio-Pliocene3; (iii) 1.9 Ma to 100 ka (ka = 100,000 years), i.e. Quaternary4 (Türkecan 2015). Several authors, from Haksal (1981) to Westaway et al., (2009), have studied the Quaternary activity of the volcano. This activity produced many cones and craters which top today the preceding Miocene lava accumulation on the N-S backbone of the shield. Cones and craters emitted very fluid basaltic flows which flow eastwards in direction of today’s River Tigris valley. With ages of 1.2 to 1.07 Ma (Westaway et al. 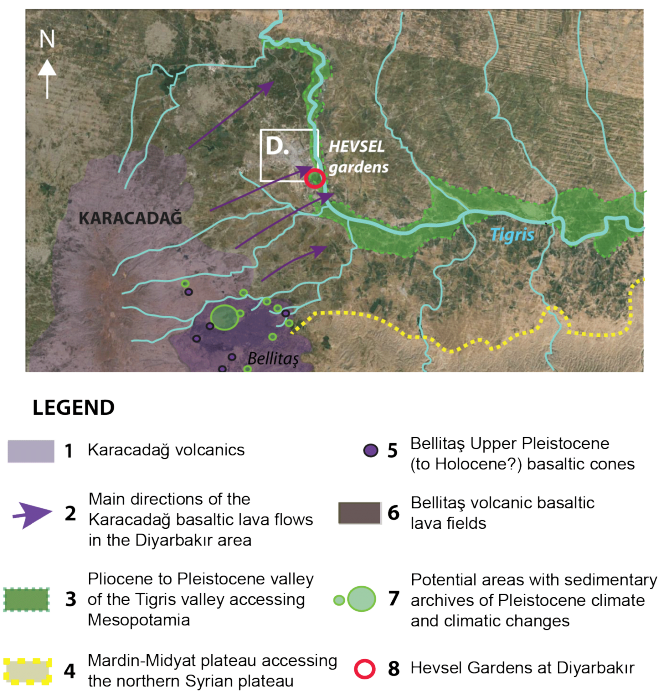 2009), the Diyarbakır flows belong to an early phase of this Quaternary activity. These ages pre-date very coarse alluvium fossilized below the basaltic flow (visible at Mardin Gate in Diyarbakır: Fig. 7). The Early Pleistocene5 alluvial deposits belonged to a sheet-flow type hydraulic system that can be visualized when looking at similar (although later) alluvium pieces blanketing the plateau surface formed by these very lava flows east of Diyarbakır. 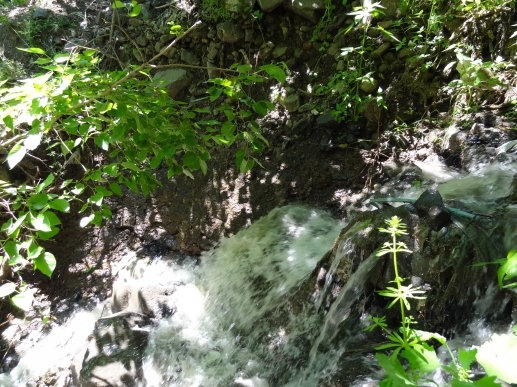 When the Diyarbakır flows were emitted, the collector-drain transporting the pre-basalt alluvium was located roughly at the same place as today’s River Tigris (Fig. 13), although it may have had a flow direction different from that of today. 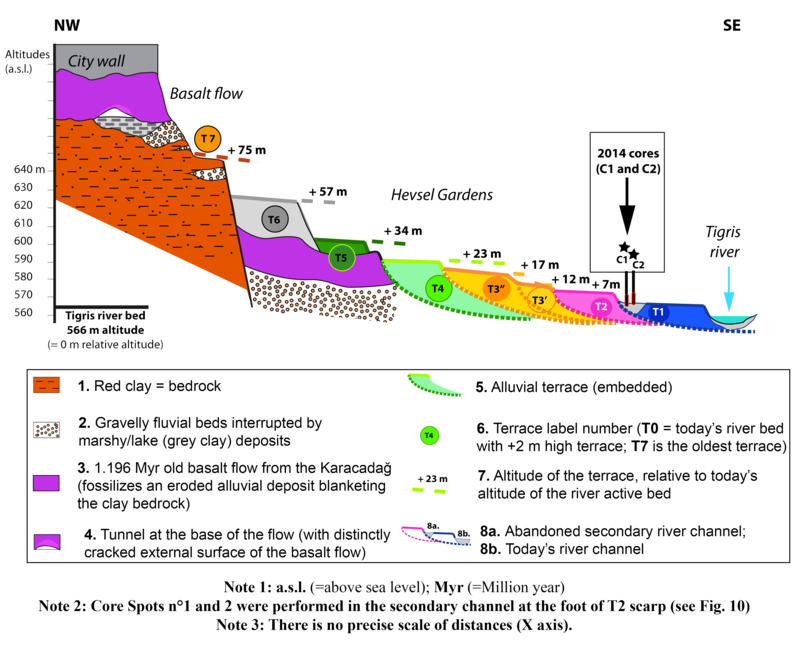 Today’s River Tigris flows now ∼60–70 m below the floor of the Early Pleistocene alluvium fossilized by the lava flow forming Diyarbakır City eastern cliffs (Fig. 7). South of Diyarbakır, the river crosses a deep and narrow gorge incised into a geological series topped on both sides by the Early Pleistocene basalt flows. Outflowing from the gorge, the river turns eastwards, forming an elbow eastward (Fig. 14). This elbow was triggered during Upper Miocene or Upper Pliocene (?) by the building up of the Karacadağ volcano which is obviously set over a former drain used by a palaeo-river Tigris flowing west toward a palaeo-Euphrates (Fig. 14). According to dates published in Westaway et al., (2009), these flows are Middle Pleistocene aged (600-430 ka ago). They cover a sedimentary series formed by alternations of coarse alluvium and red clays, which record a lake-like environment with a highly varying level (Fig. 15). This lake landscape and surrounding alluvial fans thus possibly dates Early Pleistocene. It may have resulted from the hydraulic disorganization created by the lava dams across the west-oriented palaeo-Tigris. The top of this sedimentary series is positioned ∼21–22 m above today’s riverbed, meaning that only the last 20m of the River Tigris incision dates Middle and Upper Pleistocene. This observation and calculation may not be transposable upstream the gorge since, if we are right in assuming that there is only one lava flow at Diyarbakır, a fault-movement contributed to 20m of the 70m apparent incision of the river at Diyarbakır. Arger, J.; Mitchell, J.; Westaway, R., (2000). “Neogene and Quaternary volcanism of Southeastern Turkey”. In Bozkurt, E.; Winchester, J.A. ; Piper, J.D.A. (eds. ), Tectonics and Magmatism of Turkey and the Surrounding Area. Geological Society, London, Special Publication 173, p. 459-487. URL: http://dx.doi.org/​10.1144/GSL.SP.2000.173.01.22. Bridgland, D.R. ; Demir, T.; Seyrek, A.; Pringle, M.; Westaway, R.; Beck, A.R. ; Rowbotham, G.; Yurtmen, S., (2007). “Dating Quaternary volcanism and incision by River Tigris at Diyarbakır, Southeast Turkey”, Journal of Quaternary Sciences 22, p. 387-393. URL: http://dx.doi.org/​10.1002/jqs.1074. Canbolat, E., (2005). Karacadağ (Diyarbakır) volkan jeomorfolojisi. Yüksek Lisans Tezi, İstanbul Üniversitesi Sosyal Bilimler Enstitüsü Coğrafya Anabilim Dalı., 83 p., (Unpub.). DSI, (1979). Yukarı Dicle Havzası Hidrojeolojik Etüd Raporu. DSI, Ankara. 113 p.
Doğan, U., (2005). “Land subsidence and caprock dolines caused by subsurface gypsum dissolution and the effect of subsidence on the fluvial system in the Upper Tigris Basin (between Bismil-Batman, Turkey)”, Geomorphology 71, p. 389-401. URL: http://dx.doi.org/​10.1016/​j.geomorph.2005.04.010. Doğan, U., (2005). 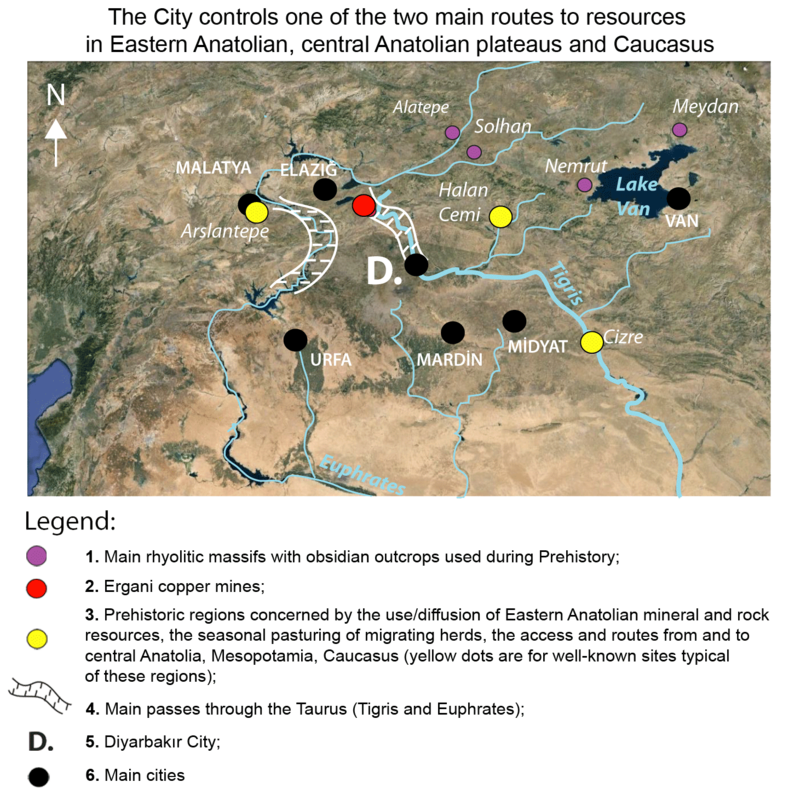 “Holocene fluvial development of the Upper Tigris Valley (Southeastern Turkey) as documented by archaeological data”, Quaternary International 129, p. 75-86. URL: http://dx.doi.org/​10.1016/​j.quaint.2004.04.008. Ercan, T.; Fujitani, T.; Matsuda, J.; Notsu,, K.; Tokel, S.; Ui,, T., (1990). “Doğu ve Güneydoğu Anadolu Neojen-Kuvaterner volkanitlerine ilişkin yeni jeokimyasal, radyometrik ve izotopik verilerin yorumu”, Maden Tetkik ve Arama Dergisi. 110, p. 143-164. URL: http://bulletin.mta.gov.tr/​mtadergi/​110_10.pdf. Karadoğan, S. and Kozbe, G., (2013). “Yukarı Dicle Havzasının (Batman-Bismil Arası) Jeomorfolojik Özellikleri ve Arkeolojik Yerleşme/Buluntu Yerlerinin Dönemler Boyunca Mekan Etkileşimleri”, In Öner, E., (ed. ), Professör Doktor İlhan Kayan’a Armağan, Ege Üniversitesi, İzmir, p. 540-564. URL: http://www.dicle.edu.tr/​a/​skaradogan/​eser/​f2.pdf. Kuzucuoğlu, C., (2002). “Preliminary observation on the Tigris Valley terraces between Bismil and Batman”, In Tuna, N. and Velibeyoğlu, J. (eds. ), Salvage Project of the Archaeological Heritage of the Ilisu-Carchemish Dam Reservoirs Activities in 2000, METU, Ankara, p. 759-771. Kuzucuoğlu, C., (2003). 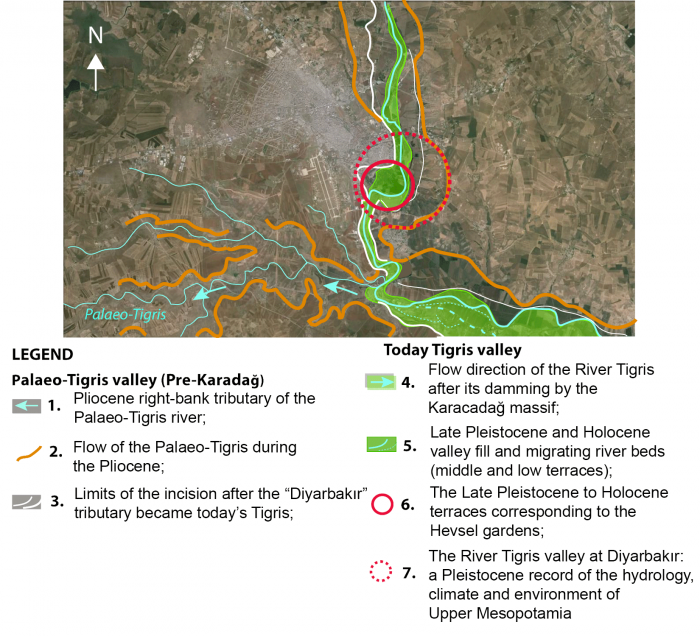 “The geomorphological setting of Kavusan Höyük in the Tigris valley near Bismil (Diyarbakır) and its significance for Holocene evolution of the river dynamics”, In Tuna, N. and Velibeyoğlu, J. (eds. ), 4th TAÇDAM Report, Publications ODTÜ, Ankara. Lustrino, M.; Keskin, M.; Mattioli, M.; Lebedev, V.A. ; Chugaev, A.; Sharkov, E.; Kavak, O., (2010). “Early activity of the largest Cenozoic shield volcano in the circum-Mediterranean area: Mt. Karacadağ, SE Turkey”, European Journal of Mineralogy 22, p. 343-62. URL: http://dx.doi.org/​10.1127/​0935-1221/​2010/​0022-2024. Salvati, R. and Sasowsky, I.D., (2002). “Development of collapse sinkholes in areas of groundwater discharge”, Journal of Hydrology 264, p. 1-11. URL: http://dx.doi.org/​10.1016/​S0022-1694(02)00062-8. Şaroğlu, F. and Emre, Ö., (1987). “Karacadağ volkanitlerinin genel özellikleri ve Güneydoğu Anadolu otoktonundaki yeri”, Türkiye 7.Petrol Kongresi Bildiriler Kitabı, p. 384-391. Turhan, N.; Balcı, V.; Günay, Y., (2002). “1/500.000 Ölçekli Türkiye Jeoloji Haritası Diyarbakır Paftası”, Türkiye 1/500.000 Ölçekli Jeoloji Haritaları 17, In Şenel, M. (ed. ), MTA Yay., Ankara. Türkecan, A., (2014). Türkiye Volkanitleri. Güneydoğu Anadolu Bölgesi Volkanitleri (Böl. 9), MTA Pub, Ankara, p. 257-266. Westaway, R.; Guillou, H.; Seyrek, A.; Demir, T.; Bridgland, D.; Scaillet, S.; Beck, A., (2009). “Late Cenozoic surface uplift, basaltic volcanism, and incision by the River Tigris around Diyarbakır, SE Turkey”, International Journal of Earth Sciences 98, p. 601-625. URL: http://dx.doi.org/​10.1007/​s00531-007-0266-z. Bridgland, D.; Westaway, R., (2008). “Climatically controlled river terrace staircases: a worldwide Quaternary phenomenon”, Geomorphology 98, p. 285-315. URL: http://dx.doi.org/​10.1016/​j.geomorph.2006.12.032. Cullen, H.M.; deMenocal, P., (2000). “North Atlantic influence on Tigris-Euphrates Streamflow”, International Journal of Climatology 20, p. 853-863. URL: http://dx.doi.org/​10.1002/1097-0088(20000630)20:8<853::AID-JOC497>3.0.CO;2-M.
Kehl, M.; Skowronek, A., (2009). “Nature and age of Late Quaternary basin fill deposits in the Basin of Persepolis/Southern Iran”, Quaternary International 196, p. 57-70. URL: http://dx.doi.org/​10.1016/​j.quaint.2008.06.007. Kuzucuoğlu, C., (2004). “Late Pleistocene environmental changes in Anatolia: records from sediment sequences and geomorphological studies”, In Algan, O. and Mater, B. (eds), Earthsystems, Istanbul Univ. Press, p. 19-27. Kuzucuoğlu, C., (2006). “Presentation of the geology and geomorphology of the Euphrates Valley in the surroundings of Zeugma”, In R. Ergeç (Ed), Zeugma, from Past to Future, Gaziantep, p. 111-117 and CXXV-CXXIX. Kuzucuoğlu, C., (2007). “Climatic and environmental trends during the Third Millenium BC in Upper Mesopotamia”, In Kuzucuoğlu, C. and Marro, C. (eds. ), Sociétés humaines et changement climatique à la fin du troisième millénaire: une crise a-t-elle eu lieu en Haute Mésopotamie?, Actes du Colloque de Lyon (5-8 décembre 2005), Varia Anatolica XIX, IFEA / De Boccard, Istanbul / Paris, p. 459-480. URL: http://www.persee.fr/​doc/​anatv_1013-9559_2007_act_19_1_1113. Kuzucuoğlu, C., (2013). 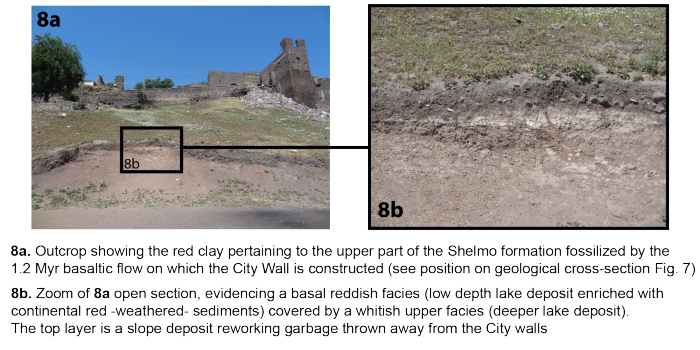 “Geomorphology of the Melendiz River in Cappadocia (Turkey): setting of Pre-Pottery Neolithic sites of Aşıklı and Musular, and climate reconstruction during the onset of the Holocene”, Geografia Fisica e Dinammica Quaternaria, 36, p. 95-105. URL: http://dx.doi.org/​10.4461/GFDQ.2013.36.7. Kuzucuoğlu, C.; Karabiyikoğlu, M.; Fontugne, M.; Pastre, J-F.; Ercan, T., (1997). “Environmental changes in Holocene lacustrine sequences from Karapınar in the Konya Plain (Turkey)”, In Dalfes, N.; Kukla, G.; Weiss, H. (eds), Third Millenium BC Climate Change and Old World Collapse, NATO ASI Series, 149, p. 451-163. URL: http://dx.doi.org/​10.1007/978-3-642-60616-8_18. Kuzucuoğlu, C.; Bertaux, J.; Black, S.; Denèfle, M.; Fontugne, M.; Karabıyıkoğlu, M.; Kashima, K.; Limondin-Lozouet, N., (1999). “Reconstruction of climatic changes during the Late Pleistocene, based on sediment records from the Konya Basin (Central Anatolia, Turkey)”, Geological Journal 34, p. 175-198. URL: http://dx.doi.org/​10.1002/(SICI)1099-1034(199901/06)34:1/2<175::AID-GJ820>3.0.CO;2-M.
Kuzucuoğlu, C.; Fontugne, M.; Mouralis, D., (2004). “Holocene terraces in the Middle Euphrates valley, between Halfeti and Karkemish (Gaziantep, Turkey)”, Quaternaire 15, 1-2, p. 195-206. URL: http://dx.doi.org/​10.3406/quate.2004.1767. Kuzucuoğlu, C.; Christol, A.; Mouralis, D.; Dogu, A-F.; Akköprü, E.; Fort, M.; Brunstein, D.; Zorer, H.; Fontugne, M.; Scaillet, S.; Reyss, J-L.; Guillou, H.; Karabıyıkoğlu, M., (2010). “Formation of the Upper Pleistocene terraces of Lake Van (Turkey)”, Journal of Quaternary Science 25(7), p. 1124-1137. URL: http://dx.doi.org/​10.1002/jqs.1431. Kuzucuoğlu, C.; Dörfler, W.; Kunesch, S.; Goupille, F., (2011). 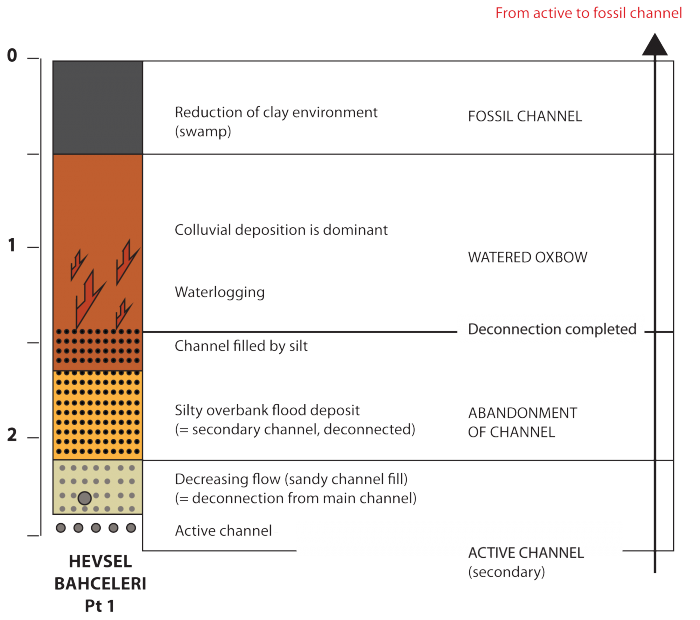 “Mid-Holocene climate change in central Turkey: the Tecer lake record”, The Holocene, 21(1), p. 173-188. URL: http://dx.doi.org/​10.1177/0959683610384163. Sarıkaya, M.A. ; Çiner, A.; Zreda M., (2011). “Quaternary Glaciations of Turkey”, In Ehlers, J.; Gibbard, P.L. ; Hughes, P.D. (eds. ), Developments in Quaternary Science 15, p. 393-403. URL: http://dx.doi.org/​10.1016/B978-0-444-53447-7.00030-1. Dow, G.; Olewiler, N.; Reed, C., (2005). “The transition to agriculture: Climate reversals, population density, and technical change”, Economic History 0509003, Econ WPA. URL: http://econpapers.repec.org/​RePEc:sfu:sfudps:dp05-01. Kuzucuoğlu, C., (2014). “The regional scale of the Neolithic in Anatolia: Issues about chronology and environmental contexts”, In G. Arnaud-Fassetta and N. Carcaud (Eds), Important Orientations in French Research in the Field of Geoarchaeology, CNRS Publications. Messerli, B.; Grosjean, C.; Hofer, T.; Nunez, L.; Pfister, C., (2000). “From nature-dominated to human-dominated environmental changes”, Quaternary Science Reviews 19, p. 459-479. URL: http://dx.doi.org/​10.1016/​S0277-3791(99)00075-X. Middleton, G.D., (2012). “Nothing Lasts Forever: Environmental Discourses on the Collapse of Past Societies”, Journal of Archaeological Research 20, p. 257-307. URL: http://dx.doi.org/​10.1007/s10814-011-9054-1. Riehl, S., (2012). “Variability in ancient Near Eastern environmental and agricultural development”, Journal of Arid Environments 86, p. 113-121. URL: http://dx.doi.org/​10.1016/​j.jaridenv.2011.09.014. Robinson, S.A.; Black, S.; Sellwood, B.; Valdes, P.J., (2006). “A review of palaeoclimates and palaeoenvironments in the Levant and Eastern Mediterranean from 25,000 to 5000 years BP: setting the environmental background for the evolution of human civilization”, Quaternary Science Reviews 25, p. 1517–1541. URL: http://dx.doi.org/​10.1016/​j.quascirev.2006.02.006. Telelis, I.G., (2005). “Historical-Climatological Information from the Time of the Byzantine Empire (4th-15th Centuries AD)”, History of Meteorology 2, p. 41-50. URL: http://www.meteohistory.org/​2005historyofmeteorology2/​04telelis.pdf. Algaze, G., (1989). “A New Frontier: First Results of the Tigris-Euphrates Archaeological Reconnaissance Project”, Journal of Near Eastern Studies 48(4), p. 241-281. URL: http://www.jstor.org/​stable/​544449. Algaze, G.; Breuninger, R.; Lightfoot, C.; Rosenberg, M., (1991). “The Tigris-Euphrates Archaeological Reconnaissance Project: A preliminary report of the 1989-1990 Seasons”, Anatolica XVII, p. 175-240. Hauptmann, H., (2002). “Upper Mesopotamia in its regional context during the early Neolithic”, In Gérard, F. and Thissen, I. (eds. ), The Neolithic of Central Anatolia: internal developments and external relations during the 9th-6th millennia cal. BC, Istanbul, Ege Yay., p. 263-75. Laneri, N.; Pfälzner, P.; Valentini S. (eds. ), (2012). 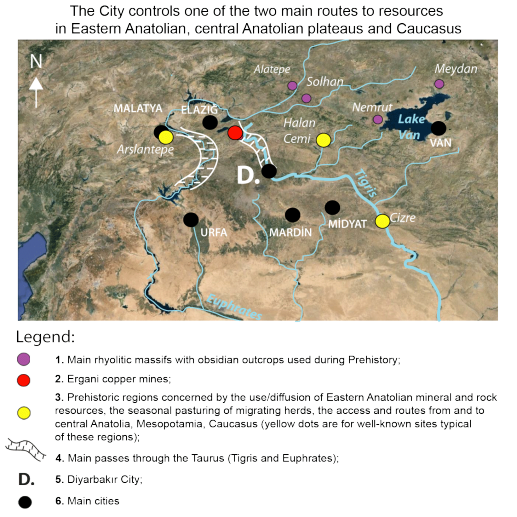 Looking North The Socioeconomic Dynamics of Northern Mesopotamian and Anatolian Regions during the Late Third and Early Second Millenium BC. Studien zur Urbanisierung Nordmesopotamiens Band 1, Wiesbaden. Özdoğan, A., (2007). “Çayönü”, In Özdoğan, M. and Başgelen, N. (eds.) Anadolu’da Uygarlığın Doğuşu ve Avrupa’ya Yayılımı: Türkiye’de Neolitik Dönem, Yeni Kazılar, Yeni Bulgular, Istanbul, Arkeoloji ve Sanat Yay., p. 57-97. Özkaya, V. and Coskun, A., (2009). “Körtik Tepe, a new Pre-Pottery Neolithic A site in southeastern Anatolia”, Antiquity 83 (320). URL: http://antiquity.ac.uk/​projgall/​ozkaya320/​. Parker, B.J. and Creekmore, A., (2002). “The Upper Tigris Archaeological Research Project: A Final Report from the 1999 Field Season”, Anatolian Studies, 52, p. 19-74. URL: http://dx.doi.org/​10.2307/​3643077. 1 The Last Glacial: 115,000 to 15,000 years ago; the Late Glacial: 15,000 to 11,400 years ago; the Holocene: 11,400 years ago to today. 2 Upper Miocene is dated 11.6 to 5.3 Ma ago. 5 Plio-Pleistocene transition is dated 2.6-1.9 Ma ; Early Pleistocene is dated 1.9 - 0.5 M;. Middle Pleistocene is dated 0.5 to 0.12 ka; Upper Pleistocene is the period covering the last 115 ka. KUZUCUOĞLU, Catherine ; KARADOĞAN, Sabri. The Hevsel Gardens: archives of human activities and of the past and present evolution of the River Tigris at Diyarbakır In : L'Hevsel à Amida-Diyarbakır : Études et réhabilitation de jardins mésopotamiens [en ligne]. Istanbul : Institut français d’études anatoliennes, 2015 (généré le 20 avril 2019). Disponible sur Internet : <http://books.openedition.org/ifeagd/1230>. ISBN : 9782362450617. DOI : 10.4000/books.ifeagd.1230. Kuzucuoğlu, Catherine, et Sabri Karadoğan. “The Hevsel Gardens: archives of human activities and of the past and present evolution of the River Tigris at Diyarbakır”. Assénat, Martine. 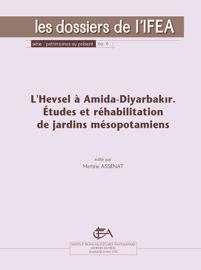 L'Hevsel à Amida-Diyarbakır : Études et réhabilitation de jardins mésopotamiens. Istanbul : Institut français d’études anatoliennes, 2015. Web. <http://books.openedition.org/ifeagd/1230>. ASSÉNAT, Martine (dir.). L'Hevsel à Amida-Diyarbakır : Études et réhabilitation de jardins mésopotamiens. Nouvelle édition [en ligne]. Istanbul : Institut français d’études anatoliennes, 2015 (généré le 20 avril 2019). Disponible sur Internet : <http://books.openedition.org/ifeagd/1226>. ISBN : 9782362450617. DOI : 10.4000/books.ifeagd.1226. Assénat, Martine, ed. L'Hevsel à Amida-Diyarbakır : Études et réhabilitation de jardins mésopotamiens. Istanbul : Institut français d’études anatoliennes, 2015. Web. <http://books.openedition.org/ifeagd/1226>.